Orzo is probably one of my favourite pasta types. Hands down. Orzo is a rice-shaped pasta that you can cook and serve in the same way you do rice. That is, you can boil it until the liquid is absorbed, cook it risotto-style, or bake it, which is what we are going to do. And, because it is pasta, you can also cook it via the traditional pasta method where you drain away the excess cooking liquid after it is done. Like other kinds of pasta (and rice), you can serve it hot or cold, as a side dish, and as a component in casseroles, soups, and salads. 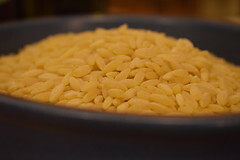 Orzo usually comes in a basic pale yellow colour.